As Amy Stewart writes in The Drunken Botanist, “Every great drink starts with a plant.” Bourbon is made mostly from corn, tequila from agave, gin from grain and vodka from, well, just about anything. Similarly, calling on inspiration from early season garden bounty makes for great cocktail mixers. In the case of these drinks, the base vegetable shrubs, syrups and juices are equally terrific served sans booze. They’re just another delicious way to get in more veggie servings per day! 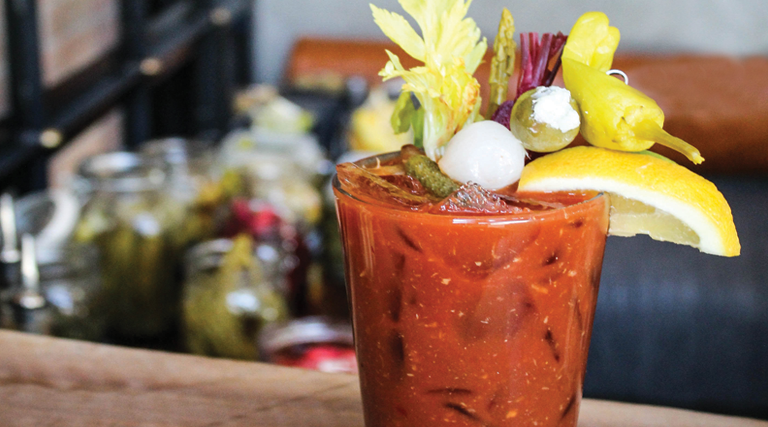 No list of veg-forward beverages would be complete without a stellar bloody mary, and the Beehive State has no shortage of delicious examples. When I’m in the mood to go all out on pickled and preserved “choose your own adventure” garnishing, Tupelo in Park City has all options gloriously covered with a pretty spectacular serve-yourself mix-in bar, including dozens of hot sauce options, fresh-grated horseradish and more pickled veggie options than you can shake a skewer at. From the simple to the sublime, all of it tops their sassy and savory housemade tomato juice base from a recipe developed by chef Matt Harris. Blend all ingredients together and refrigerate until ready for use. Makes about 5 cups mix. To assemble a bloody mary, to a pint glass with ice add 1½ ounces of vodka and fill to the rim with bloody mary mix. Stir well to combine and garnish extravagantly. When I told bartender extraordinaire Tracy Gomez that I was contemplating a feature on veggie-based cocktails, she immediately said, “I’m in!” and rose to the challenge with the delicious panache and glam style I’ve come to expect from the Finca bar program. Gomez even made this original frothy sipper completely vegan by using aquafaba. “Use this magical ingredient in place of egg white in sour-style cocktails,” Gomez says. “It is simply the liquid from can of sodium-free organic garbanzo beans.” She prefers using aquafaba over egg whites, both to reduce the risk of salmonella and for better consistency, since it has an almost entirely neutral flavor. Gomez’s garden shrub also makes for a delicious alcohol-free beverage when stirred up over ice with an equal part club soda and squeeze of fresh lemon. Shake all ingredients vigorously with ice. Fine strain into a stemmed cocktail glass. Let stand momentarily for the foam to set. Garnish with a small fennel frond, pinch of black pepper and fennel pollen (if available). *Garden shrub: Rough chop about one mounded cup total of green fruits, herbs and vegetables (Gomez uses apple, cucumber, mint, fennel and green bell pepper). Add the chopped garden mixture to a blender with one cup each granulated sugar and apple cider vinegar. Blend until completely smooth, then strain out the solids. Keep refrigerated in a non-reactive sealed container (will keep for several months). Makes about 2 cups shrub. Full disclosure: It’s hard to pick just one drink off of the ever-changing Zest bar menu as the epitome of a veggie-forward beverage. They have a slew of them. Think carrot juice mimosas, spicy jalapeño margaritas and kombucha-based cocktails, all refreshing and concocted with cold-pressed juices made fresh in the Zest kitchen daily. 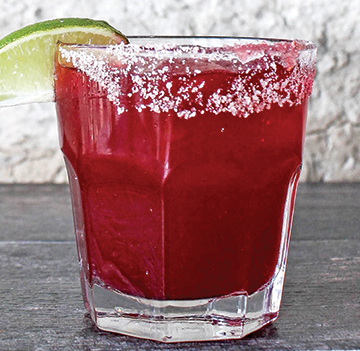 For this gorgeously hued margarita, fresh beet juice provides an earthy balance to the tequila and citrus notes without the added processed sugar found in most margarita mixes. Win-win! Rub the rim of a rocks glass with the cut side of a lime. Dip the rim in sea salt, and fill glass with fresh ice. To a shaker with ice, add all ingredients and shake until well chilled. Strain into serving glass; squeeze in lime juice and garnish with lime. 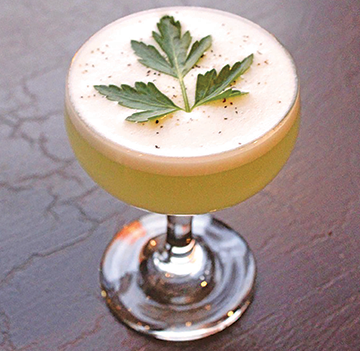 Celery is so much more than a bloody mary garnish! 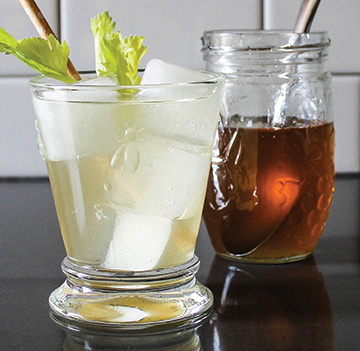 This easy celery syrup base replicates the flavors of bottled celery sodas made popular at the beginning of the 20th century. In this case, I substituted agave nectar for the sugar or corn syrup found in most commercial sodas. Mix a couple of tablespoons of celery syrup with 3 to 4 ounces club soda over ice for a refreshing no-alcohol spritzer. Method: Add 2/3 cup agave nectar to one cup boiling water. Stir until completely dissolved. Add one heaping tablespoon of ground celery seeds and let steep for 3 to 4 hours at room temperature. Strain through several layers of cheesecloth. Store in a lidded jar in the refrigerator for up to one month. Makes about 1½ cups syrup.